The new Cortex-A76 chipset uses a microarchitecture built from scratch and claims a performance gain of 200 percent over earlier Cortex-A73 CPUs. The performance of high-end smartphones have increased by leaps and bounds over the years, but there is always room for improvement. ARM, the architects behind mobile chipsets have unveiled a product destined for future smartphone chipsets. The latest addition is aimed for high-end smartphones and promises laptop-class performance. The new additions include the Cortex-A76 CPU, Mali-G76 GPU and Mali-V76 video processor for ultra-high resolution displays. The Cortex-A76 will replace the Cortex-A75 high-performance cores unveiled last year, while the Mali-G76 will succeed the G72. The Mali-V76 replaces the V52 and V61. The Cortex-A76 are performance cores or the ‘big’ part of the big.LITTLE arrangement. ARM hasn’t announced ‘LITTLE’ cores to support the new one. As a result, chipmakers are likely to stick with the existing Cortex-A55 for now. The naming of the new CPU may make it seem like a minor upgrade, but the Cortex-A76 is a new CPU from the ground up. The CPU features a completely new high-performance microarchitecture design that ARM claims to have made from scratch to deliver higher performance. ARM is calling the performance of the new CPU ‘laptop class’. Apple to buy ARM (and AMD)? 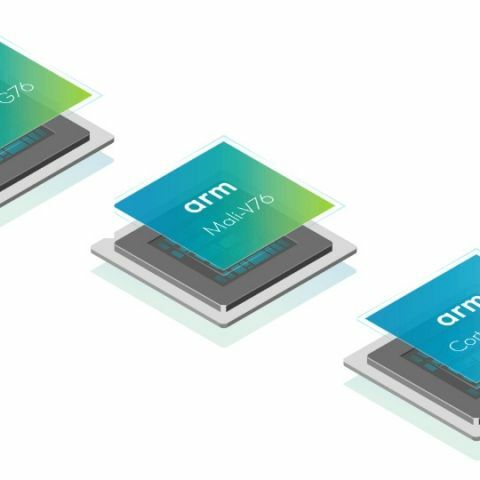 ARM claims the new Cortex-A76 CPU can deliver a 200 percent performance gain over the current laptops powered by Cortex-A73 CPUs. While gains over the last gen Cortex-A75 may be lesser, the difference is still noticeable. More importantly, the Cortex-A76 is particularly proficient in machine learning tasks, with up to a 400 percent gain in performance, courtesy what ARM states ‘optimised dot product instructions’. The A76 is based on the 7nm manufacturing process and will deliver speeds up to 3GHz improving performance by around 35 percent over a 10nm A75 running at 2.8GHz. Furthermore, ARM is claiming a 40 percent boost in energy efficiency thanks to a change in microarchitecture and a smaller target process node. The CPU is designed in a way that a single A76 core can run at full power indefinitely, and frequency throttling will only kick in when there is a 3 or 4 core cluster configuration, especially in thermal and power constrained environments like smartphones. This will essentially result in more consistent high-end performance for devices that will use the A76 cores. ARM is using its proprietary DynamIQ cluster technolgy that will see the Cortex A76 paired with power-efficient Cortex-A55 cores in a heterogeneous configuration. The octa-core layout is perhaps the likely configuration we will see the new cores in, while a 2+6 or a 1+7 will offer better performance-to-cost ratio for cheaper chipsets. Coming to the new GPUs, the Mali-G76 is based on the same Bitfrost architecture like the older G72 and G52, but at 7nm, it offers a 1.5x performance boost. The performance boost has been achieved by doubling the number of execution pipelines within each core’s engine. This, ARM claims, doubles the FP32 and FMA throughput with only a 28-percent increase in area. As a result, the G76 GPU is around two time as powerful as the G72. Apart from the boost in performance, the Mali-G72 claims a 30 percent improvement in energy and area efficiency when built on the same process node. But going down to 7nm will improve performance and efficiency even further which will help in improving battery life without compromising on the performance. The Mali-76 can be configured for four to 20 cores, which is a downgrade from the 32 maximum cores with the G72. The higher core counts are for products with larger batteries and where thermal constraints are not much of a factor, like laptops. Finally, the Mali-V76, is designed for high-res displays. It can support up to 8k60 decode and 8k30 encore as well as multiple 4K and 1080p streams. Undoubtedly, this is double the performance from the older Mali-V61. While this is totally overkill for smartphones displays, the Mali-V76 is likely to be used in high-end TVs and high-res AR and VR headsets.